Hatfield, PA (February 20, 2013) - Gendex introduces SRT™, Scatter Reduction Technology, to its award-winning GXDP-700™ Cone Beam 3D system. This new feature allows clinicians to reduce artifacts caused by metal or radio-opaque objects such as restorations, endodontic filling materials, and implant posts. The use of SRT image optimization technology delivers 3D scans with higher clarity and detail around scatter-generating material. 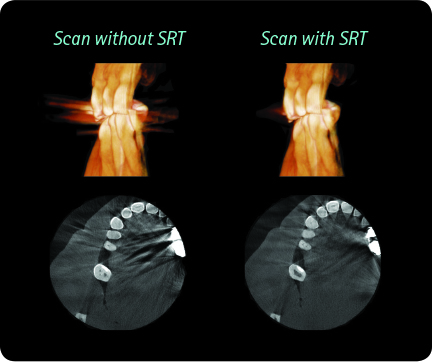 SRT represents a significant aid when 3D scans are required for a variety of procedures from endodontic to restorative and the post-surgical assessment of implant sites. "We continue to make significant investments in research and development to bring new, meaningful innovations to the market," says Mike Bosha, Senior Product Manager for Gendex. He adds, "Our proprietary SRT technology further enhances the diagnostic capabilities of the modular GXDP-700 Series." The introduction of SRT to the GXDP-700 platform aligns with the Gendex design philosophy focused on delivering innovations with clinicians and patients in mind. The activation of SRT is a very simple and easy step. When a scan is prescribed near a known area of scatter generating material, the user only needs to select the SRT button from the GXDP-700 touchscreen interface to utilize this new optimization technology. Gendex will unveil the new SRT technology at the Midwinter Dental Meeting in Chicago, IL held on February 21-23, 2013. In booth #4200, Gendex will showcase the GXDP-700 cone beam 3D system with the new SRT image optimization technology, along with its full line of comprehensive imaging solutions: from digital intraoral sensors and panoramics to intraoral cameras. Gendex, known for its innovative and dependable products, offers a wide variety of comprehensive digital imaging solutions for both general dentists and specialists. The company’s strong history in continuing innovation, along with a deep dedication to deliver products that exceed the needs of dental professionals, have earned Gendex recognition as a global leader. Learn more about the full line of Gendex products at www.gendex.com.